First of all congratulations! if you are reading this you are most likely on the vegan wagon or you are considering jumping on it. Either way let me say a HUGE THANK YOU for saving the animals, for helping the planet and for looking after yourself. I often say that going vegan was one of the easiest decisions in my life. Becoming one was a completely different story. More about it you can read here and here. While for some people going vegan is as easy as pie for others (like myself) the beginning of this journey can be a disaster. It took me some time and a lot of trials and errors to figure out how to implement this lifestyle effectively. So if you want to skip the hard part and want to learn from my mistakes you are at the right place. 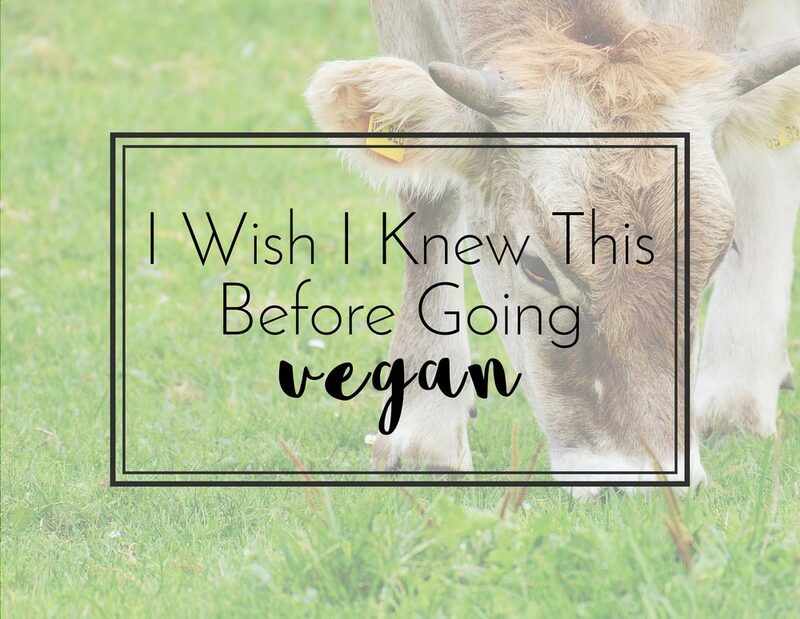 I made for you this list of practical things which I wished I knew before going vegan. This one is a big deal and I am starting with it for a reason. When I went vegan I assumed that I have to eat the same amount of food that I used to eat before just excluding all animal products, of course. Huge mistake! The animal foods are often calorie dense and they contain much more calories per gram compared to the plant-based foods. So you can’t really have two bananas and handful of spinach and call it a meal. No my friend, you have to eat a lot and by “a lot” I mean just that. Before I used to eat a scoop of potatoes for a meal now I eat around a kilo. You see the difference? Just try to increase your portion size gradually as you might find it difficult to eat 8 - 10 bananas for breakfast at once. It is hard for me to be specific how much exactly you should eat because everyone has different needs. For example a girl who is not very active won’t need as much food and calories as an active male athlete. There are tons of tools online that you can use to calculate your approximate calorie intake based on your body mass index (BMI), your physical level and your goals. Another way is to use pre - made meal plans that can keep you going until you figure out for yourself how much you have to eat. I recommend 21 - Day Vegan Meal Plan with various delicious and easy to make recipes. There is also a free app so it won't hurt to give it a try. If you don’t eat enough I can guarantee you that you are going to feel weak, unhappy and miserable all the time. Really not a good place to be especially when you expect to feel just the other way around. Another huge mistake that I made and that I really want you to avoid is NOT to consume too much fat. When I went vegan I didn’t eat as much as I needed to (remember the small portions?) so naturally I was constantly hungry. And when you are hungry your brain screams for calorie dense foods that can fill you up instantly. Those are the foods that contain fats such as seeds, nuts, avocado, coconut, nut butters, etc. All of these are great, healthy foods but in moderation. When your diet is consisting predominantly of these healthy fats they turn into enemies. There is massive debate regarding the optimal consumption of fats in a healthy diet. I can't tell who is right and who is wrong and probably the answer is different for everybody. However I can speak from experience. And when I was consuming too much fats I was feeling crappy all the time. My overall state of body and mind improved when I introduced high-carb and low in fat vegan diet. By all means don't exclude the healthy fats from your diet just consume them in moderation. If you want to learn more on this topic I suggest you to read 80/10/10 by D. Graham and The China Study by T. Colin Campbell. I know that this one is no brainer but yet most people assume that when you go vegan you instantly become a health magnet. You can be unhealthy on any diet, including vegan, especially if you eat a lot of junk food. I often say that chips and beer are vegan but you won’t be very healthy if you eat just that. Of course I know that nobody is living on chips and beer but I had to make a point. There is plenty of processed vegan food which is no better for your health than its non-vegan counterparts. The fact that no animals are harmed in the making of these foods is amazing but if you want to be healthy and feel good on the inside you might want to avoid overly processed vegan food. You are more than welcome to indulge once in awhile with a vegan donut but please remember that the whole-food plant-based diet is the best for your health so strive to eat as much real food as possible. Soy is absolutely amazing plant and it’s so versatile that you can practically made anything out of it. Plus is really inexpensive so what’s not to like about it, right? Unfortunately many vegans fall into this trap, myself included. The truth is that fermented soy products such as miso, tempeh and soy sauce has proven health benefits. However the non fermented ones, such as fresh soybeans, sprouts, meat substitutes, soy milk and tofu are the ones you should be very careful with. "They contain Phytic acid which bind to metal ions, preventing the absorption of certain minerals, including calcium, magnesium, iron, and zinc -- all of which are cofactors for optimal biochemistry in your body. This is particularly problematic for vegetarians (vegans), because eating meat reduces the mineral-blocking effects of these phytates (so it is helpful—if you do eat soy—to also eat meat)." And since we are not eating any meat here (nor we are planning to) I think it's only wise to avoid the consumption of unfermented soy products as much as we can. The full article written by Dr. Mercola on the topic you can read here. Anyway what concerns me the most is the fact that soy contains high amounts of phytoestrogen which mimic the body's natural estrogen hormones. This can lead to a hormonal imbalance in both women and men and can further cause infertility, menstrual problems and a lot more. You should be especially careful with the consumption of soy if you are suffering from hormonal acne because it will wreak havoc on your skin. Trust me, I've been there. As usual moderation is the key, so don't exclude soy all together from your diet just be very mindful when consuming it. Newbie or not you’ve probably heard about this one since “Where do you get your protein?” is getting worn off and the trendy question right now is “Yeah, but what about B 12?”. It's true that vitamin B12 can't be found in the vegan diet naturally. However it's also true that it doesn't occur naturally in the animals as well. Vitamin B12 is a microbe -a bacteria- it is produced by microorganisms and it lives in the soil. Therefore the animals has to ingest it first and only after that we can supply it from their meat. Which means that the argument of the meat eaters that vegan diet is not optimal for us since we have to supplement ourselves with vitamins is irrelevant. First because most of the meat eaters suffer from vitamin B12 deficiency as well. Second, meat eaters supplement the B12 throughout the meat of the animals. And third, because the majority of meat eaters are taking whole bunch of supplements whatsoever. So whether you are vegan or not you should take at least 10 micrograms of vitamin B12 per day. This you can do by consuming fortified foods such as plant milks, soy products, nutritional yeast etc. or by taking vitamin B12 capsules like I do. This post is getting really long and I'll stop for now, however I have few more tips for you... so stay tuned for Part 2! If you don't want to miss any updates or the latest post from the blog you can SUBSCRIBE with your email.